The first part of 2015 started out slowly and then the pace did pick up. Once the thaw was over, buyers seemed to jump on everything, looking for a great home to purchase. It was definitely a busy time. An optimistic outlook after a nasty winter brought both hopeful buyers and also sellers into the market and many new listings followed. The question is, how did that translate into buyers making offers and purchasing homes? An increase of home sales this year over last year at the same time was up approximately 12%. Great for sellers and buyers alike. Inventory began increasing after the snow melted when sellers saw the activity. Sellers were excited to see the surge, and made sure to have their home listed and ready to be scooped up. So what homes are for sale? This chart shows the active number of listings over the last six months. for the Town of Newburgh. 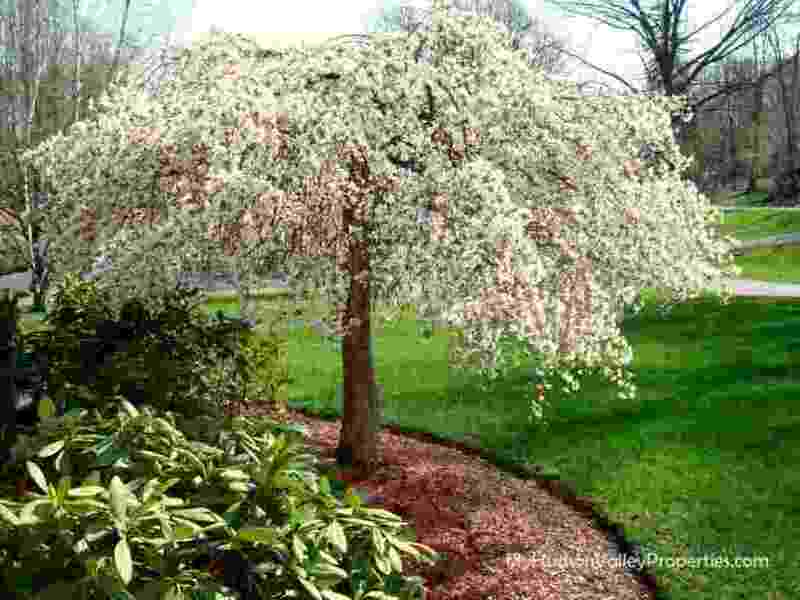 Fluctuation normally occurs seasonally and that is no surprise. Our current inventory of homes is at a 14.98 month supply indicating that we remain in a buyers market. This is down from last years number of over 16 months of available inventory. That means less choices for buyers than last year, but there are still quite a few homes on the market. As buyers were actively purchasing homes, the local sellers put their homes on the market quickly. What happened with the pricing of homes? The average home prices remained flat. Not really much improvement at all. As new inventory entered the market there is still a large number of homes for sale. There is always the need for prices to reflect the fair market value and not what owners wanted to see. While buyers had less to choose from, buyers were not willing or able to pay higher prices. 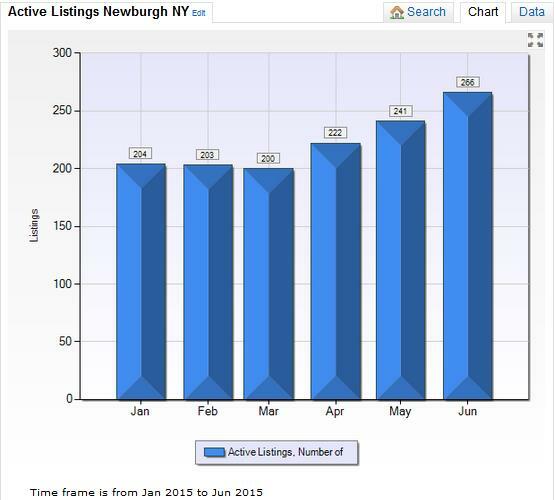 The inventory of Newburgh NY homes actually decreased 3.3% since last year at the same time. Buyers found that the spring the inventory of new homes entered the market pretty close to fair market value. These were the homes that sold first. Properly priced homes did see multiple offers and quick sale. Pricing didn’t really adjust upward much for this although it may happen soon as inventory of good homes dwindles. Buyers do have a good deal more to choose from right now. There are less bank owned and short sale properties flooding the market. As the competition to sell a home increases, pricing will adjust. Sellers are aware that their home needs to stand out from the rest. If they truly want to sell, we see repairs and staging before a home even enters the market. It is important to stand out from the crowd when selling your home. Condition drastically affects the outcome of offers. When selling your home it needs to show well, be easily accessible and priced to compete with the rest of the homes on the market. Homes don’t sell for what an owner wants, needs or has already invested in the property. It sells only for fair market value. Understanding what homes have sold in your neighborhood and how an appraiser will view your home when the time comes, can be the difference between listing and selling a home. Proper pricing is key to getting the highest and best offer the local market will bear. There are 53 homes currently under contract – 20 went under contract in June. The average sold price in June was $ 236,277 spending an average of 141 days on the market ranging from $125,000 to $422,000. In the last twelve months there were 213 closed sales with an average sold price of $234,323 spending an average of 154 days on the market. The majority of our inventory sold between $200K and $300K. 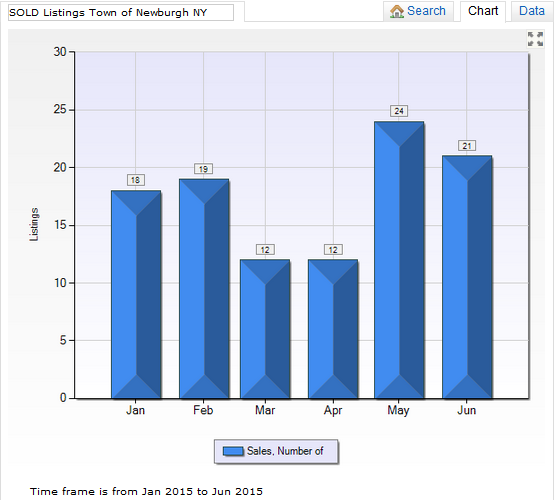 The Town of Newburgh NY home absorption rate is at a 14.98 month supply of inventory which is down from last year. When I work with buyers the common request on their wish list is to find a new home meets their needs. Buyers that are smart enough to recognize value when they see it make offers that reflect the true current value. They watch the market and learn as much as possible about what is for sale, what is bank owned and what prices homes have recently sold for. Homes priced in the $200 to $300K is the most popular price point. We have homes that range from the $100’s to over $1 Million. New construction is part of the equation and the range for that is from $260,000 and up. Knowing the homes that are selling where you live is important. Remember that when you purchase a home today it changes many things about your financial future. When it is time to sell we can help put all the pieces to the puzzle together with you. Let us provide you with important information that you need, with our FREE comparative market analysis. I hope you enjoyed reading this article. If you would like to receive more information please subscribe to my blog. 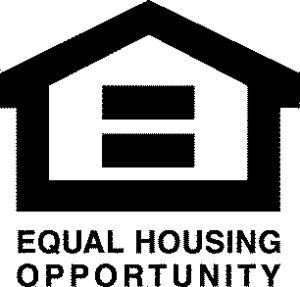 No Spam No hassles, just info on local housing. Looking to buy a new home? Search the MLS for New Homes in the Hudson Valley. Feel free to contact me anytime at (845)-527-7115 or come visit me on Google+ Statistics represent single family homes for sale in Newburgh NY (source HGMLS ). Information is deemed reliable, but not guaranteed.